When is the Hitman 2 release date? IO Interactive has announced that the Hitman 2 release date is coming later this year, so here are the latest Hitman 2 trailer and gameplay details. 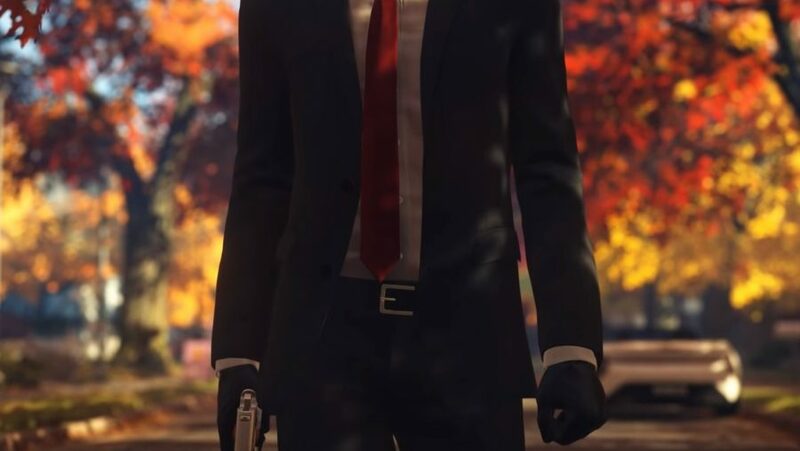 Before a Hitman 2 release date could even be a thing, we needed a Hitman reboot that would be a return to form for the series. After the leaden and muddled Absolution, it’s clear IO intends to build on the same sandbox formula they’ve perfected over the past few years. After some stealthy – but decidedly non-violent – deduction work, we know loads of Hitman 2 trailer and gameplay details. We know the location of the first two missions, the ways in which the design of the initial game is being expanded, and a few of the silly/excellent costumes you’ll be donning. Here’s everything we know about Hitman 2. IO Interactive was not shy about revealing this one. The Hitman 2 release date is November 13, 2018. Hitch-free assassinations require patience, but that’s barely a wait at all. All of Hitman 2 locations have been revealed it looks like Agent 47 is going to acquire lot of air miles. The six locations are Miami, Colombia, New Zealand, India, USA, and the North Atlantic with Austria being the setting for the Sniper Assassin Game Mode. We’ve seen plenty of Miami and Columbia and in IO’s most recent trailer we can feast our eyes on Hawke’s Bay, Mumbai, Vermont and the Isle of Sgàil. Miami was the first Hitman 2 location that we got to feast our eyes on. We’ve played through Hitman’s 2 Miami mission where Agent 47 attended the final hours of the Global Innovation Race a spectacle for the fastest cars in modern racing. In Miami you are tasked with killing a motorsport driver. We’ve also played the game’s second mission, and know that Agent 47’s work will take him to the thick Colombian jungle. In this level, foliage is your ally as Agent 47 will be slinking through the underbrush to make his kills. There are three targets: Rico Delgado, Jorge Franco, and Andrea Martinez. There are hippos, heavy-chandeliers, drug-filled souvenirs, a precariously rickety gold statue, and the opportunity to stab someone with a tattoo pen. Clearly creatively bumping people off will remain at the forefront of this sequel. IO also said in a press release that guards won’t be the only threat this time, so prepare for wild animals and poisonous plants. Hawke’s Bay, New Zealand looks to be an interesting location. The location trailer shows Agent 47 on a beach at night time perusing his target, sand being kicked up everywhere. With just the sand dunes and the sea for as far as you can see, its going to put your stealth skills to the test. Mumbai is on the complete opposite end of the spectrum, its loud, crowded, and there are plenty of opportunities for a sneaky and stealthy kill. The image of picture perfect America, Wittleton Creek is the ideal American suburb. From the location reveal trailer, it looks to be fall in the quiet neighbourhood complete with white picket fences and red and yellow trees lining the roads. Maybe Agent 47 decided to give up the hitman life and settle down? Not likely. Himmelstein is where Hitman 2’s Sniper Assassin Game Mode will take place. You’ll be using the lush gardens and grand chateaus to hide and disguise yourself as you hunt down and eliminate your target, and do some wedding crashing at the same time. Unfortunately, IO has been pretty quiet about the mysterious Isle of Sgàil so there’s not much to report. The Hitman 2 official website describes it as “one of the most secretive places in the world…” You can catch glimpses of it, and all the other locations, in the Hitman 2 location reveal trailer below. The 26 minutes of Hitman 2 gameplay in the video below will be familiar to fans of the series. In the level, Miami, you’re tasked with killing motorsport driver Sierra Knox and her father. The reveal trailer detailed three methods of killing Knox – fitting her car with a bomb, sabotaging the vehicle so it crashes, or, if you think your aim is good enough, shooting her during the race. It’s a Hitman game, though, so naturally we can expect there are many more methods – both those planned by IO and those discovered by creative players. You can read our full Hitman 2 PC review here. As you’ll know if you’ve been following the series, the last Hitman enjoyed a staggered release, arriving in six episodes between March and October 2016. That was a brave decision at the time, but it proved successful and popular. However, the studio is moving away from that model for Hitman 2. When it launches, the entire game will be released in a single package. Alongside the full release, IO Interactive have announced the Hitman 2 DLC Legacy Pack which will bring all six locations from the last Hitman game into the new release. These locations will include a new progression system as well as all the new gameplay changes coming to Hitman 2. If you own the first Hitman then this remaster package will be available to you for free, which is a nice touch. If you include these original locations, Hitman 2 will have a total of 12 miniature sandboxes. 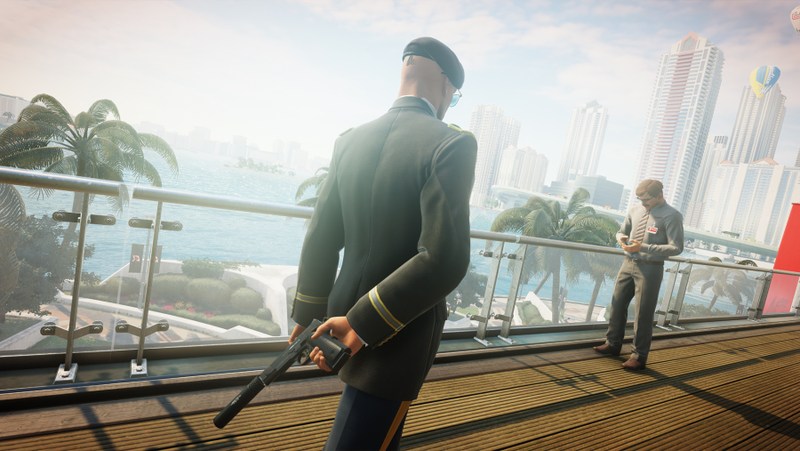 Despite Hitman 2 dropping its episodic development, IO Interactive plans to support the game after launch with Hitman 2 live content – there will be elusive targets, contracts, and escalations released after launch. The first confirmed Hitman 2 elusive target is none other than Sean Bean, who challenges Agent 47 to take him on in the Miami level. Given Sean Bean’s track record of surviving in movies, TV series, and games, we don’t fancy his chances against the barcode baldy. 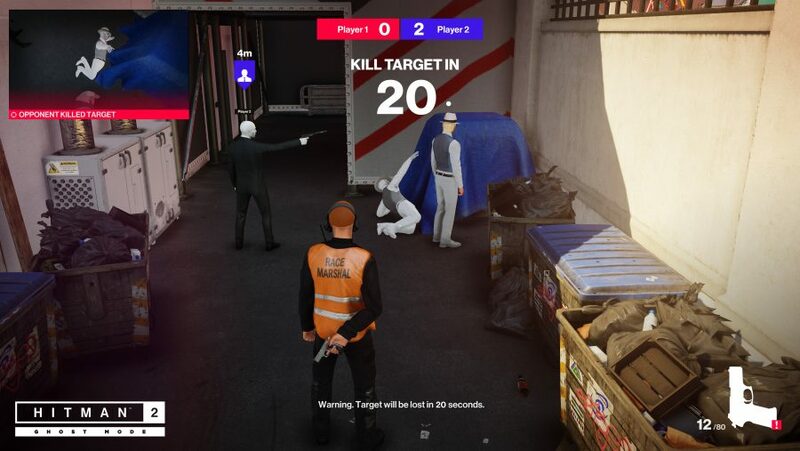 While not a part of the core campaign, the game has two multiplayer components: a co-op mode called Hitman 2: Sniper Assassin, and a competitive mode called Ghost. Sniper Assassin has you and a friend work as a team of snipers infiltrating and killing a set of targets, each of whom is heavily guarded. You’ll have to work together to take out targets and their guards, ideally without raising the alarm. On the reveal stream, IO Interactive was keen to stress it’s “not just a shooting gallery” and will have all the depth of the main game. Ghost mode, meanwhile, sees you compete against another player to reach five unnoticed kills first. Each of you plays in your own instance of the level, but you’re able see your opponent’s ghost at all times, allowing you to know what they’re up to and even which disguise they’re wearing. While you can find disguises and items in the normal manner throughout the level, there are also ghost crates which contain a random selection of kit. Crucially, these are shared and so anything you take won’t be available in the other player’s world. There are also ghost coins, which when thrown distract NPCs and targets in both realities – plenty of opportunity for deceptive play, then! 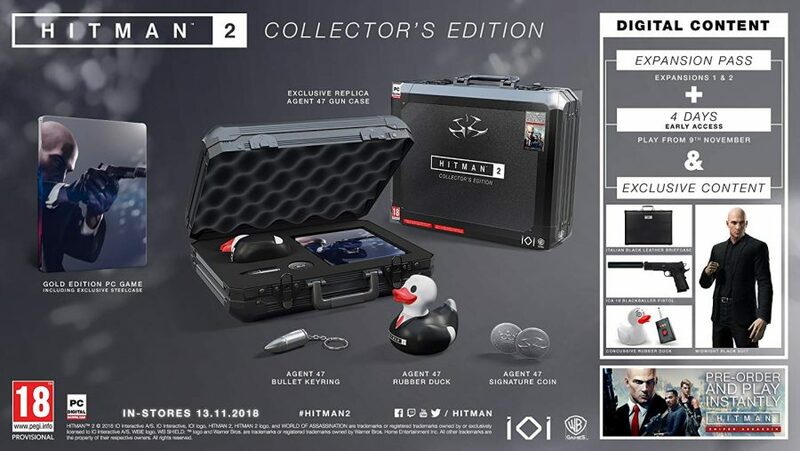 Shortly after Agent 47’s next outing was revealed, IO also announced a Hitman 2 collector’s edition. In the snazzy foam suitcase we have a copy of the game – always a win in our book, a bullet keyring, 47’s signature coin, and suited-and-booted rubber duck. This special squeaky toy is a recurring joke in the Hitman series, and now you can have one in your real-life bath, if you so wish. We don’t know if there will be a Hitman 2 beta to test its multiplayer component yet, but we’ll let you know here if there are any announcements. No announcement would be complete without a Hitman 2 trailers to accompany it – here is the first one below. It gives us a sneak peek at the Formula 1-focused Miami level, and it promises that we’ll have more opportunities for creative assassinations than ever before. The second trailer is a teaser for the Columbia level titled ‘Welcome to the Jungle’. The trailer focuses on the quiet ambience of the South American landscape, perfect for stealth and being sneaky. It’s not likely that we’ll see Agent 47 swinging from any tree vines. Check out the second gameplay trailer below, which features Agent 47 in a very fashionable rain poncho. Not long now until the Hitman 2 release date, so keep checking back for more information as we learn it.